Well, this demands, wait for it......BACON NACHOS!! Yes, I did it, and I don't even feel bad about it! 1. Preheat oven to 400 degrees. Cut the pieces of bacon in half. On a foil lined baking sheet with a cooling rack placed on top, place the bacon pieces in a "v" formation (so they look a bit like tortilla chips, not so they look like a flock of migrating birds). Bake the bacon for about twenty minutes. 2. While the bacon is baking, in a small bowl, make the salsa by combining the finely diced tomato and red onion with the minced jalapeno, the chopped cilantro, and the lime juice. Salt and pepper to taste (but do remember that the bacon is quite salty, so lots of salt isn't really necessary). Set aside. 3. When the bacon looks like it's five minutes from being perfectly cooked, add the grated cheddar and return to the oven. After five minutes or so (checking to make sure the cheese and bacon don't burn), take the bacon out of the oven and allow to cool down slightly for a few minutes. 4. 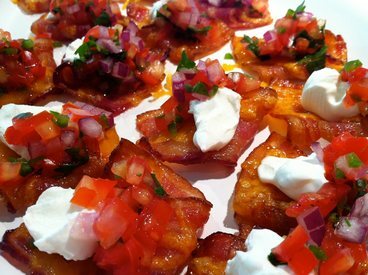 Place bacon nachos on a serving dish and give each one a dollop of sour cream and a spoonful of salsa. 5. Kick off your shoes, put on some cut off denim shorts, and enjoy your bacon nachos!